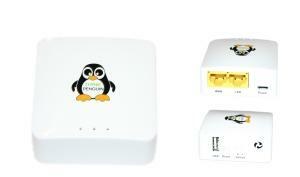 Introducing the first 100% free software wireless mini router with Respect Your Freedom certification. The router ships with the most up-to-date free software embedded GNU/Linux distribution today: LibreCMC. LibreCMC was built from the Linux-libre kernel and a stripped down version of OpenWRT without the non-free bits. LibreCMC is the modern free software distribution designed for todays routers. Besides being freedom-friendly we've teamed up with VPN service providers to make protecting your privacy easy. By increasing the flash and adding support for VPN LibreCMC can now be utilized to tunnel all your wireless traffic through to a privacy friendly VPN service provider. No longer do you have to trust your local ISP to protect your traffic. For those without a technical aptitude we recommend purchasing VPN service with the router. For those with a technical mindset we have detailed directions for a number of different VPN providers including: PenguinVPN (ThinkPenguin), Private Internet Access, AirVPN, IPredator, NordVPN, PureVPN, BlackVPN (customer supplied, available from support page, use at own risk), and HideMyAss (help us improve our documentation by telling us your favorite VPN provider). In order to provide great support for our customers around the world we need to know which power adapter you need. Different regions utilize different power standards and plugs. Select the power adapter appropriate for your region or contact support. Get the latest release of LibreCMC and help support the projects development. Select this option and we'll flash the latest release of LibreCMC before the router ships. Otherwise we'll ship with whichever release was available at the time of assembly. Don't have a VPN provider yet? Subscribe to PenguinVPN and we'll pre-configure the device to work “out of the box”. All you'll have to do is plug the power and ethernet in, then select the libreCMC-VPN access point on the devices you'd like to connect. Do you have more than one computer or device that you would like to physically connect to your network? By connecting an ethernet switch you can connect many more desktop computers and other devices. If you're purchasing an Ethernet Switch please select the associated power adapter for your region (we ship to countries with different power outlets). If no switch is selected no Ethernet Switch Power Adapter will be shipped. Never brick your router again. With this SOIC-clip, jumper wires, and the appropriate hardware you can flash an otherwise bricked router. Perfect for anybody looking to develop for LibreCMC. In order to connect to a wireless network in GNU/Linux, you need a compatible wifi adapter. Many adapters aren't well supported- or supported at all. If you have an adapter that lacks native support, you may want to pick one up one of our adapters.